Maradhi Manni: Krishna Devi Temple...An Old Dilapidated But Beautiful Temple In Mahabaleshwar! Krishna Devi Temple...An Old Dilapidated But Beautiful Temple In Mahabaleshwar! We went on a road trip two weeks back from Chennai to Mahabaleshwar! Came back home via Goa... We visited 3 ancient forts (my son's favourites!). And we visited this temple also! It was drizzling and the whole area was covered by fog. The passage to the temple was narrow and slippery. Behind Panchganga temple, there is a small trail that leads to Krishnabai temple where the Krishna river is worshipped. It is built on the hilltop overlooking the Krishna valley and was built in 1888 by a ruler of Ratnagiri on the Konkan coast. The temple has a Shiva lingam and a beautiful statue of Krishna. A small stream of the river flowing from a cow-face (gomukh) falls on a ‘Kunda’ or water tank. Stone carved columns and ceilings are the special characteristics of this temple. This old temple has gathered moss and is in ruins. It is not visited much by tourists and is isolated. But it provides a most exquisite view of the river Krishna. Since it was a bit dark because of the rains and fog and the time was nearly 6 pm, I could not see the gods properly/clearly. I noticed the whole garbha gruha was wet (no water stagnation though). Only few lamps were there. The flowers looked beautiful on the dark stones. We were just soaking in the drizzling rain and walking around! The pond where the water flows from the 'gomukh' looks as if it is not used or cleaned. A priest came there after sometime and closed the door of the sannidhi...wooden door which looks new. A few people came when we were there. Otherwise, the whole area looked very quiet and pleasant. You can notice from the pictures below. The garbha gruha and the Gomukh...Looks serene without any other distractions! The legend says that River Krishna starts from this Gomukh statue (Cow's mouth)...The water comes like this throughout the year, it seems. The garbha gruha...sanctum sanctorum ...The frame, the door, the silver thrishool and Nagaraja looks as if they were added in the recent years. A small Shiva linga was visible. Nandi (Lord Shiva's vaahana/transport, bull!) statue in front of the temple. You can notice the fog behind it. We could not view the river properly from the railings but saw the scene which is given below. We could have seen the beautiful panoramic view of the Krishna valley if the weather was clear! The waterfall which flows into the Krishna river below! Notice the plastic bags and bottles thrown by the 'tourists'...dirty people. This was visible from the railings near the temple. This scene diffused the happy feeling we had, while roaming around the temple. Many people mention this temple as Krishnabai temple. I don't know which name is right. I liked the way the surroundings near the temple being maintained by somebody...it is spotless, no dead leaves or any other debris. Very nice. Well...this visit is going to stay in my memory. Cool pics. Looks like you have taken the pics during the fresh hours of early morning, or it gives me that feel. I have started to take a fantasy for dawn, recently. Hope I too will be able to travel and enjoy seeing such places in future. DESTINATION INFINITY: We were there in the evening at 6 pm. The weather was pleasant, since it was drizzling...it is heaven for us, Chennaiites! You will enjoy these places, D.I. Beautiful photos with description. Heard of this place but not gone. Thanks for the share thru ur blog. Hope u had a memorable trip with ur family. Beautiful photos Sandhyaji!! I love visiting old temples, there is something special in every stone and rock sculptures and you actually feel the presence of God and peace around. May be it's to do with hundreds of years of worship that God actually resides there unlike modern newly built temples. There were many instances when I visited old historic temples with family that I felt really light at heart and received complete peace of mind. It is refreshing to even see the photos, the places look nice!! Lovely Pics Sandhya ! 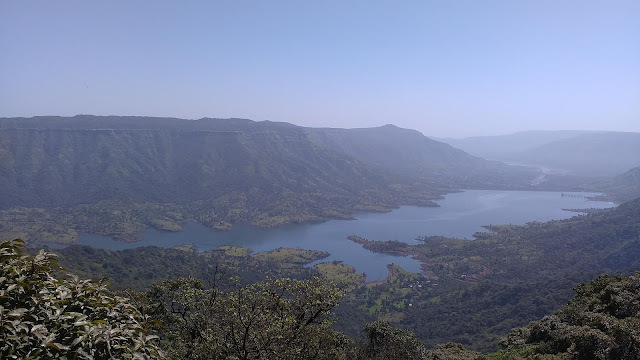 I think we also saw it when I went to mahabaleshwar..its a lovely place. The view must be awesome if there isn’t fog! The temple looks marvelous, very quiet and neat, although the moss and plants slowly destroying the temple. This sounds like a place similar to Thalai Cauvery with a tank beneath and expose to frequent rain/drizzle. Hope the govt. takes some step to preserve the temple, and the trashes on the fresh stream are disturbing. Btw. Superb capture on the temple and fresh looking ambiance! USHA BASKER: We enjoyed the trip thoroughly! Walked a lot, climbed a lot, ate a lot....! The place was peaceful and we were happier because of that! SAI CHARAN: I too like to visit ancient temples than new temples! This one was very good though it is not very active. Serene nature was a plus point here! RENU: We enjoyed visiting this place, Renu...one thing because crowd was not there and another, the surroundings! JEEVAN: Thank you, Jeevan! We had visited Thalai kavery many years back....I remember clouds crossing our faces...my sons were small then! They were giggling! That also was a nice place! Such a lovely temple. I like temples which doesn't have too many people around. Did to travel by car this time also? Would love to readmore about the places visited by you, and would also love to see the pictures. RAMA ANANTH:Yes, we went by car. We too love ancient and not so crowded temples. I seem to be writing more about my trips than about other matters nowadays! Thank you, Rama! Our Hindu Rituals! Should We Change Some Now? This Is To The Lovers Of 'Reader's Digest'!